I’m proud to have been invited to contribute to a new initiative launched earlier this year called Everyday Futures – a collaboration between the Australian National Museum, the University of Sydney, the University of New South Wales and the Australian National University. The brief: Choose an object from the places you love, and tell a story about the changes happening there … a story about living in the Anthropocene. I chose an object from my childhood that made a long and lasting impression on me – on many fronts. 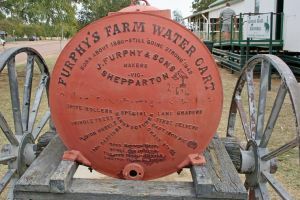 It is the Furphy’s Farm Water Cart – one of which was a fixture on our farm at Kellerberrin for decades and a source of a long-lasting, life lesson, thanks to an inscription on the tank, and my father’s insistence that his children always strive to do their the best.